Businesses around the world face a common major problem. After investing resources to build effective lead generation processes, they’re finding that generating more leads -- sometimes even 100 times more than previous lead volumes -- does not guarantee conversion to revenue at the rate necessary to support such efforts, let alone the company’s growth objectives. Anecdotes on this subject abound. Inbound marketing agencies are getting fired even after exceeding lead volume targets. Marketing executives, who have seen their budgets multiply to support such efforts, are again under the gun to demonstrate sufficient revenue. 64% of field sales people’s time is wasted on administrative responsibilities around demand generation. 54% of salespeople won’t meet quota. Whatever lens you look at this through, one thing is clear -- we have a lead management problem that must be addressed to ensure growth. When I talk with people about this issue, I hear one of two typical responses. The first (and most common) is the look of recognized pain with some relief. They recognize the problem because they’re dealing with it, and they’re relieved to discover they’re not alone. Marketing creates leads. Once a lead is generated, salespeople will immediately reach out to, connect with, and have conversations with those leads with little to no friction. Salespeople will be warmly greeted, get the meetings that are required with the right people, and the sale progresses to a proposal. The salesperson is quickly able to make recommendations and move to close the deal. While this scenario is a bit of an overstatement, the perception that this is how it’s all supposed to work is far more prevalent than it should be. Companies today -- both small and large -- build very flat marketing and sales funnels. A ton of time and money is invested in activities to create awareness, including websites, marketing strategies, advertising, prospecting, etc. But after awareness or the first download, the only step they’re set up for is to move to the sales process -- whether the lead is ready for it or not. To further the myth, many companies who have adopted an inbound marketing approach operate under the assumption that if they create enough good content, the right people will find them, reach out to them and their revenue goals will be met. Inbound marketing by itself contributes to the flat funnel. 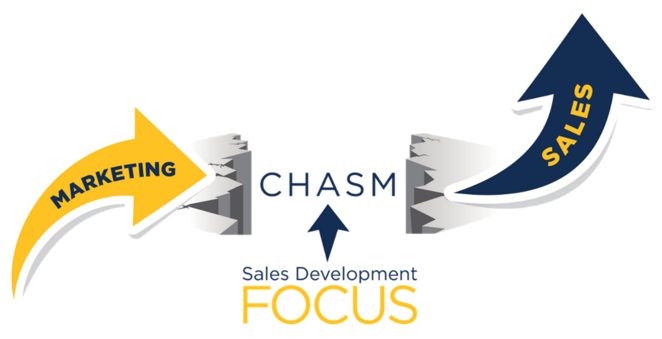 Marketing and sales (or "smarketing") done right creates a chasm. No matter what you do, the chasm will be there. Marketing does a good job producing leads, but no matter what you do, most leads are not ready to buy the instant they're created. And even the ones that are won't necessarily reach out to you to initiate a sales process. Few salespeople are trained to properly handle early stage leads. The nature of a salesperson’s focus is on making the sale, so they’ll often push things too fast. A salesperson’s time is valuable, and most businesses can’t afford to have them waste time on anything but moving new sales opportunities forward. A study of the best growth organizations uncovers a “third discipline” in demand generation efforts; one designed specifically to bridge the chasm between marketing and sales. That discipline is called Sales Development. At first glance, many people think that sales development and inbound marketing are polar opposite strategies. However, upon closer inspection, you quickly realize that these two disciplines are highly complementary and work together to solve the same problem. Companies that practice inbound marketing are already experts at email and analytics. Therefore, creating an effective sales development function means integrating outbound phone prospecting (and in many cases effective nurturing) with your existing strategies. Don’t mistake sales development as merely another word for cold calling or spamming. Integrating targeted content with effective nurturing and analytics means that you are no longer blindly calling people creating no benefit or value. Effective sales development is built upon the same principle as inbound -- help first, sell last. 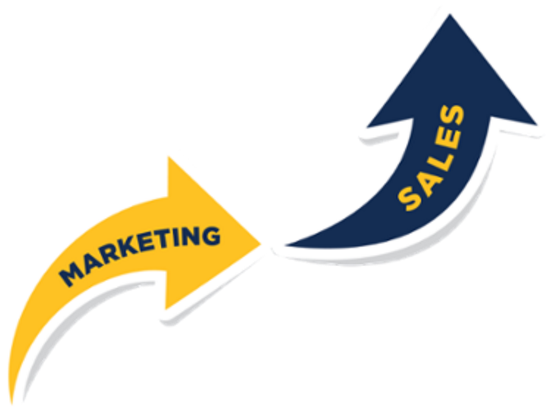 Organizations that want to build and scale have to integrate and align sales development and inbound marketing efforts. The ability to bridge the “lead generation chasm” to consistently and predictably move leads to the sales-ready status that your sales team is looking for improves the efficiency and effectiveness of all other sales efforts. In a research study conducted by the Kellogg School of Business, it was discovered that creating the type of sales specialization discussed here resulted in a seven-point increase in closing rates by those companies utilizing such an approach. Not only does this approach enable you to gain a higher velocity, but salespeople also become far more effective and produce better results. Playbooks are important in every phase of your demand generation process. With sales development, an effective playbook is absolutely crucial. The nature of an effective sales development process is built on a high volume, process-driven approach. Therefore, it is crucial that your processes be clearly laid out and communicated to be successful. There are six key components in the sales development playbook. Your playbook must clearly outline the processes and protocols for each situation. Your service level agreement (SLA) should provide the data you need for much of this section of the playbook. If you’d like to see some examples of workflows, you can see them in this video where we walk you through the playbook process, starting at 16:56. Research from Topo’s 2015 Sales Development Benchmark Report found that it takes on average eight to 12 touches (and this number is growing) to be able to get that first meaningful contact. Therefore, it’s important that your workflows involve enough outreach to optimize the result from your efforts. Marketing automation email focusing on a valuable content offer goes out on day one. The following day, the sales development rep (SDR) makes a phone call and if that’s not answered, leaves a voicemail and later sends a personal email. Two days later, the SDR attempts to make contact, but this time does not leave a voicemail or send an email if there’s no connection. One day later, another phone attempt is made with a voicemail left. The next week it repeats and starts all over. The rhythm of this outreach was developed over a period of time, using data to back the decisions about timing and frequencies. When we implement these efforts for our client base, we utilize such data to adjust it to their unique circumstances. The biggest challenge and therefore, opportunity, with sales development tactics lies in the ability to take young, inexperienced salespeople and enable them to have valuable, thoughtful conversations with senior people within your prospect’s organization. Expecting an SDR to just wing it, is a recipe for disaster. Hence the need for call scripts. But, these are not akin to the call scripts of the cold-call-cowboy days. At Imagine, we don’t even use the term scripts anymore. Instead we refer to call templates and soundbites. Your playbook should take the work you did on buyer personas and create the phraseology and soundbites SDRs can use to hold relevant conversations with prospects. The goal is to give the SDR the knowledge to go deep on specific issues, not wide. There are a small number of issues that are relevant enough to successfully drive a sales process forward, and you should only be concerned about those. Then again, you don’t want to go too deep. The goal of the sales development process is to qualify and to pass sales-ready leads to the people best prepared to manage that process. One of the most common mistakes SDRs make is to take the process too far. Use prospects’ curiosity to your advantage. A qualified lead must be clearly defined – it can’t be “I know they are qualified when I see it.” Without a clear definition, the sales development team becomes unmotivated and produces fewer leads, leading to frustration from the new sales team because they’re never sure what to expect. You can read more about creating clear definitions here. As discussed, emails are a core part of the sales development process. All emails used in the process should be included in the playbook as well as tips for how to use them effectively. Lead data technology is used to source leads and gain intelligence. Social media, selling and leveraging your social networks are predictive. Include areas that focus on executing the process: Dialers, marketing and email automation tools, and content sharing tools. Analytics and being able to track everything that’s going on: Sales operations, CRM, email tracking and analytics and a dashboard. Your technology stack should work together to produce the repeatable process that allows for delivery of predictable lead generation that ultimately leads to predictable sales. The handoff is often an overlooked piece of the process. Companies often feel as though they can handle the handoff on a case-by-case basis. This is not a good idea. 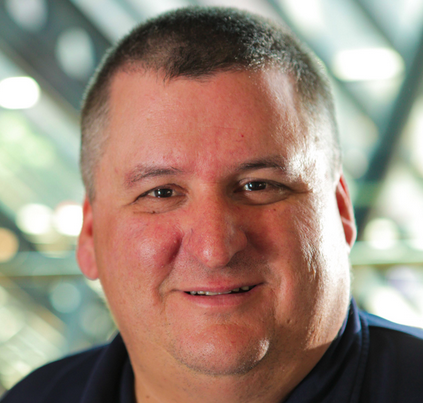 One of the most common causes of failure in the sales development process occurs because of a lack of clarity in how the handoff should occur. When the operational side is not completely clear, SDRs are not as productive as they should be. They become unmotivated. Consequently, the sales reps handling new leads aren’t sure what’s happening and as a result, are not comfortable letting go of control. Instead of two groups creating leverage by working together, they work against each other and the process falls apart. Be sure to take the time necessary to define the handoffs and operational issues. How important is generating a higher volume of quality leads to achieving your growth objectives? How much time and money are you already investing to make that happen? If you're like most growth companies that we've worked with the answer to both questions is, "A lot!" Make no mistake, the sales development playbook takes significant time and energy to build. With so much already invested, building the bridge to cross the chasm from 'qualified lead' to 'sales-ready lead' is the key to unlocking the latent value of those investments and creating the path to predictable, sustainable and scalable growth.